Full rolling motion shoes can best be defined as any type of shoe that facilitates break over in all directions: dorsal - lateral and medial. They are nothing new in farriery, for example a raised inner rim or a half round shoe (in its cross section, as often used in harness racing) are classic examples. What ever we do to at the hoof level, trough trimming and shoe type choice and placement, has larger effects on the joints closest to our work, in decreasing order: the D.I.P.J., the P.I.P.J. the M.C. / M.T. - J.P., carpus and tarsus. Biomechanically the joints in the horses digit function as near perfect hinges, designed to extend and flex at 90 degrees to the horses sagittal plane, however the D.I.P.J. has up to 15° of latero - medial movement while the P.I.P.J. and especially the fetlock have extremely small physiological latero medial excursions. Joints in the lower equine limb are mainly designed for extension and flexion and except for the D.I.P.J. (which includes the Navicular Bone) allow for little latero medial and rotational movement. On turning on solid ground it is mainly the D.I.P.J., which accommodates itself to the inclination of the body with the middle phalanx sliding and rotating on the articular surfaces of PIII and the Distal Sesamoid. The latero medial and rotational excursions between PIII and PII are limited by the D.I.P.J. capsule and collateral ligaments and the suspensory ligaments of the D.S. Latero - medial and rotational movement (collateromotion is one of the terms used by French researcher and anatomist Jean Marie Denoix for its description) also takes place in the equine digits joints on irregular surfaces and in horses with angular or rotational limb deformities even when these horses move in a straight line on a flat surface. Faulty conformation easily leads to chronic joint disease in the D.I.P. and P.I.P joints. The incidence of lameness due to articular pathology in the lower equine limb is very significant as Vets and Farriers will acknowledge and has given rise to a lot of discussion on “latero - medial balance” in trimming and shoeing procedures for its treatment and prevention. A long term study at the Veterinary Faculty of Liege University in Belgium concluded that the ideal latero medial trimming should try to even out joint spacing in the equine digit during the stance phase and the Belgians developed a radiological protocol to aid in latero medial trimming. The radiological protocol for latero medial trimming as developed in Liege aims to keep the digital joints evenly spaced in the latero - medial sense. Navicular syndrome, variously called naviculitis, podotrochleosis, palmar hoof pain (!) etc, is an important cause of lameness which blocks out at a low palmar digital nerve block. Navicular syndrome can be divided in pure flexor forms (horses which react painfully to dorsal extension of the D.I.P.J.) articular and ligamentory forms. (Which will respond to latero - medial extensions of the D.I.P.J. and might need intra articular anaesthesia to block out completely. These last two forms of Navicular Syndrome do not necessarily respond to the classical “Navicular” shoeing techniques (ease of dorsal break over, egg bars, raised heels). Indeed if it where true that Navicular Syndrome is mainly due to broken back hoof pastern - axis, underrun heels - long toed hoofs etc why is it then that racing thorough and standard breeds have an extremely low incidence of N.S.? In my, pragmatic opinion, the incidence of N.S. is very much correlated with the type of work a horse is asked to perform: anything with constant turns (show jumping, reining, dressage, or on irregular terrain (hacking, endurance). And of course with faulty conformation. F.R.M.S. bring the latero medial break over closer the centre of the foot, diminishing the articular and ligamentory strain on turning, on irregular ground or in the case of toe in or out conformation. It also diminishes the unevenly distributed stresses on the laminar suspension of PIII within the hoof capsule in these cases, which is important in laminitis therapy. Although it is possible to make a steel F.R.M.S. it easily becomes a pretty heavy and clunky affair, making it out of alloy helps with the weight but to be able to ease L.M. break over, the web has to be wide and thick towards the centre, which doesn't make it easy to fit them to the shape of the hoof. The first of the current models of F.R.M.S. where the French Springtop and the Swedish P.G. shoe. Like the American Eagle shoe, so beloved by Cornell farrier Michael Wildenstein, these shoes are not shaped to fit the trimmed hoof's form but are cut to shape and then nailed on with flat headed nails which are called P.G. nails by both Mustad and Mondial nail manufacturers. The P.G. shoe (after which the nails were named) is mainly used in standard bred training and racing. When the “arms” of its rubber (polyurethane) “star” are trimmed a little shorter and therefore closer to the centre of the shoe it facilitates L.M. break over. The Springtop which was quite revolutionary in France about 20 years ago is rumoured to have been inspired by the design of North African horseshoes which consist of a hoof shaped metal plate with a hole in the middle. Belgian and former Liege faculty farrier Philippe Vanschepdael, who was heavily involved in the research projects of the Belgian Vet school introduced a lot of European Farriers (and in Quebec) first to the Springtop and later when Springtop stopped producing, to the scientifically researched Equi + shoe. Equi + - Placement of Equi + shoe in relation to the anatomical structures of the hoof. The reaction (and I was guilty too) of most farriers in the beginning was:“ go away with those flying saucers”. To this date a lot of people react in an instinctive human - centred way, along the lines of: if I wear a shoe with a raised narrow base, I'll twist my ankles! Equine anatomy being quite different (if you lift a side of the foot high enough out of the horizontal plane eventually the opposite side of the hoof will lift of the surface, so limited is the latero medial excursion in the digital joints! ), some of us who finally tried these frisbee's on desperately and chronically lame horses, were positively amazed at the results. Springtops and Equi + shoes are cast aluminium alloy shoes, with limited wear ability, difficult to draw clips on and to tap for studs. When (quickly) worn, they are prone to breaking, besides losing their F.R.M. properties. Especially when tried on high mileage - endurance horses the shoes just wear down to fast. Fausto Fiorucci, European and World vice champion in Endurance liked the shoes and had his own, sturdier - version, cast an has been competing successfully with them ever since. The Rock n' Roll, apart from its superior material, distinguishes it self from the Springtop model in that it has more (and bevelled) heel support and more material for (cold) drawing the side clips. Like the Springtop it offers a bit more grip on slippery surfaces like grass then the Equi + type. They are available in an open version (which leaves the frog free) and a closed version like the Fiorucci model. After trimming the hoof (flat) the appropriate size F.R.M.S. is chosen, after marking right and left, the shoe is placed on the bottom of the hoof, centred in both the sagital (toe to heel) and frontal (side to side) axis of the hoof. With a felt tip the contour of the hoof is marked on the upper side of the shoe and the lateral and medial clefts of the frog, together with the nail holes are marked on the bottom of the shoe. The closed versions (Fiorucci and closed Rock n' Roll) obviously are cut to appropriate length in the heel frog area. The shoes are then cut to size with the help of a band or jigsaw or with a sharp wedge hammer, the contours softened by filing or grinding, the nail holes drilled (not stamped) and nailed on with the flat headed PG nails. It should be noted that most F.R.M.S. present a 1° wedge, which permits slightly more trimming of the heels or a slightly raised heel. The trick is to centre the shoe under the D.I.P.J. centre, for example on mismatched feet it will be placed further forward on the upright foot and further backward on the flat foot. The fit is fairly tight, (the shoes are hardly ever pulled off by overreaching) and nail placement can, if needed, be fairly far back towards the heels as the PG nails have limited side ways movement within the round (Ø 4mm) nail holes and do not interfere with heel expansion. Therapeutic use is indicated in arthrosis - arthritis in the digital joints (“ringbone”) including articular and ligamentory types of Navicular Syndrome, and desmitis of the collateral ligaments in the digit. It should be noted that a narrow hoof on deep and soft ground causes a lot of less latero - medial strain on the digit's joints and ligaments on turning then a wide one on compact ground. Consequently a F.R.M.S. has more effect on wide hoofed horses who do not necessarily work on deep ground. In my practice horses affected with these frequent pathologies improve by at least one degree of lameness (out of 4) in about 70% of cases. Improvement can take up to 15 - 20 days to show which is to be expected since it is a biomechanical therapy and not a chemical one (Bute etc) and shoeing it self can be described as a 10 minute flexion test with percussion. It is also interesting to note that chronic cases, which improve with F.R.M.S. often, turn lame again when switched back to normal shoes. Shock absorbing pads can be usefully added between the wide upper shoe surface and the hoof. Their dampening action is enhanced on F.R.M.S. by the fact that the nail heads do not come into ground contact and therefor the nails do not transmit shock and vibrations directly to the hoof by passing the shock absorption of the pad. In Laminitis therapy the painful act of turning, due to the L.M. laminar stresses caused by the uneven bearing of the precariously attached hoof capsule, is greatly reduced with the use of F.R.M.S.. The closed model Rockn'Roll is easily combined with silicone or polyurethane palmar / plantar hoof support and can in severe cases (sole penetration) be screwed on a cuff type glue on. Closed Rockn'Roll with impression material for frog - palmar support, screwed on to a glue (Adhere - Vettec) on Dall-Ric cuf type shoe. Latero medial x-ray view of the same, note the sole depth obtained trough the cuff, the frog support cushion in radio opaque condensation silicone, the subcoronary sulcus. 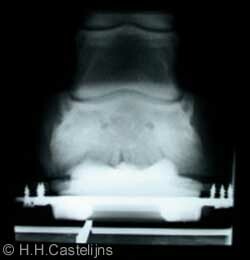 Dorso palmar x-ray showing the outer rim of the shoe relative to the D.I.P.J. To diminish D.D.F.T. pull, dorsal break over can be set back very far, either by screwing or nailing the shoe further back or by forging it back on the bottom of the shoe. If therapeutic use was the first I tried with F.R.M.S. they have an interesting preventive role, especially in horses with rotational defects (toed - in toed out); they usually diminish the latero medial deviations from the sagittal plane in the suspension phase of the stride; in normal language there is less “dishing” in a toed in horse. This might explain their success in standard bred racing. Some trotters have won serious money on them. In endurance riding the French were already using the Springtop years ago, but with frequent reshoeings (each 60 km sometimes). Fiorucci has proved their effectiveness (he shoes his horses him self), they protect the sole aren't easily lost, weigh less then normal steel shoes and the latest models go the extra mile. In reining F.R.M.S. can improve the spin exercise, and are not easily pulled while stopping. A couple of European open finalists have run on them with good results. No shoe is the ideal solution for all horses and F.R.M.S. are no exception. Deriding them out of hand as silly flying saucers, as I did in my arrogant young days, has later caused me some remorse when thinking about a couple of horses I could have probably improved. A lot of colleagues in Europe, both vets and farriers have had success on refractionary, articular lameness cases with these shoes and their use on laminitic / founder patients, pioneered by Gaspar Castelijns (equine practitioner in Spain) with the Catalan farrier Ricardo Rosello, is the shoeing system which has given us the best results in the treatment of this affection. Lever - arm between the point of L.M. break over and the D.I.P.J. in normal shoe and Rockn'Roll.